Supplied: In three litre containers of peat-free compost, healthy and well established, approximately 40-60cm (1-2 feet) high, with full planting and aftercare instructions. If you are after a tree that stands out from the forest the search is over. The Foxglove Tree has an appearance like none other and looks every bit the far east exotic it is. Introduced from China in the 1830's, Paulownia tomentosa is initially a very fast growing tree that eventually reaches a maximum of 8-12 meters making it an ideal specimen for most gardens. A mature P.tomentosa is truly a glorious site. 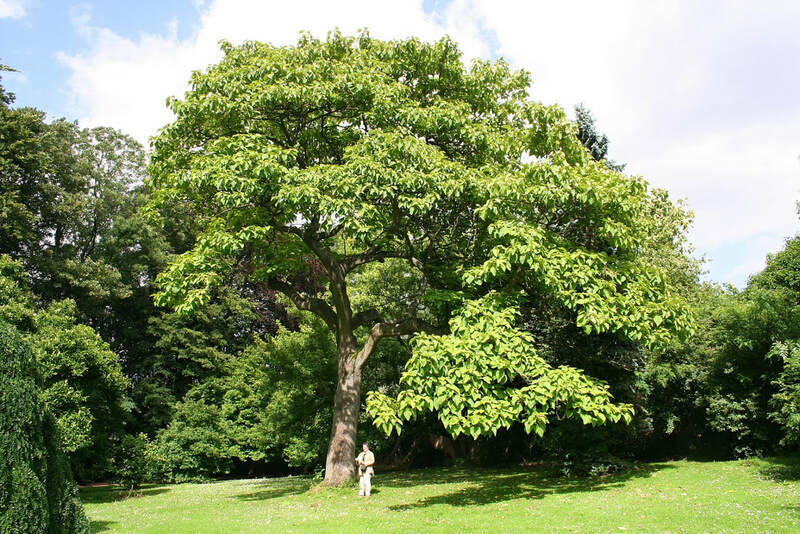 The canopy forms an attractive round-topped mass of giant - up to 50cm wide - heart shaped leaves. Before the leaves emerge, sprays of highly fragrant foxglove like pinkish lilac flowers adorn the tree during late spring. Although thought of as an exotic, Paulownia is fully to frost hardy, however flower buds and young growth may be damaged by hard late frosts. For best results grow in an area that gets plenty of sun and that can protect the young tree from strong winds until it gets established.